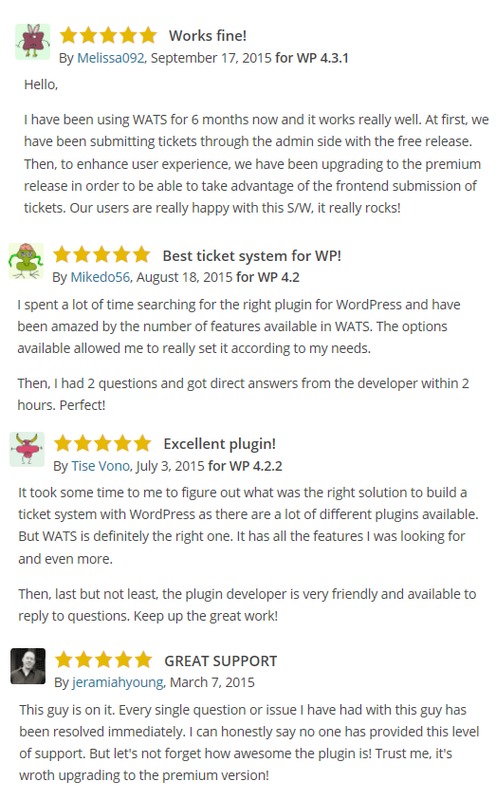 Buy WordPress Advanced Ticket System Premium Release! Click on the button above to order WATS Premium now with your credit card or your Paypal account. Then, you will receive your copy of WATS Premium by email. If you haven’t received the plugin within 24 hours after your order, please drop us an email with the Paypal order ID, an alternate email address (just to bypass potential delivery problems) and we will revert. Sometimes, the delivery email is caught by anti SPAM filters. Please don’t provide a GMail email as GMail blocks emails containing plugin attachments. Order WATS now, it is the first ticket system ever designed on top of WordPress and the most widely adopted as of today! If you still have a question or a doubt about WATS Premium that you would like us to address before ordering it, we encourage you to go through the FAQ or drop us a mail. We will revert shortly (usually within less than 24 hours). As WATS premium is non tangible item, it is not refundable. By ordering WATS premium, you fully accept this condition.